Life can change in a moment. I didn't believe it until it happened to me. I woke up in the field, as I always have, next to my mothers black. The herd dispersed a few yards apart and my father watching over us at the top of the hill. I pull my legs underneath me and get to my feet. My dry mouth reminds me of why I got up, and I make my way to the other side of the field. The moment my lips touch the water a sharp pain grabs my skin and pulls it back. Suddenly I'm back in the woods, my small slender legs stretching as far as they can go, running as fast as possible, but I can't go fast enough, and soon the overwhelming breathes of wolves over come me. The pressure of teeth on my neck makes me scream, and then my fathers there kicking and biting, I hear the screams of the wolves as a hoof hits their chest. The release of pressure brings me back from the flash back. My brother stands next to me, his blue eyes gleaming and a tuft of my mane hanging from his mouth. His small white nose twitches and he drops the hair from his mouth. "Sorry, I can't seem to remember." He smiles. I hate it when he does it. He wasn't born yet when it happened, it was about eight months ago when i was attacked. Most of the herd won't talk to me for the fear that they will bring on the flash backs. The only horses that will are my mother, brother, sometimes my father, but I don't think he can really look at me because of the scar that runs from my eye all the way to my flank. I think it reminds him of how he wasn't watching and lost me. He looks at me in his corky little way, where he flicks his brown tail and twitches his little nose. He pins his ears and tries to look mad at me. I laugh and walk away not bothering to look where he went. I walk into the woods, only I go in here. My father has never allowed anyone to go in here. Especially after the attack, but I go anyway, it's the only place where I can clear my head. I walk a few miles until I come to a soft patch of grass, a small creek runs threw the side, and a large oak tree sits to the far left. This is my place. Somehow my legs begin to move. I run next to my herd, but soon I'm passing them. I gallop past my mother, the dominant mare. Crashing into the woods the only thing I feel are sticks, and branches hitting my sides, stinging my skin. I keep going until I find myself on grass, standing under the oak tree, panting. The rest of my family barrels through the woods, coming to a stop beside me. My mother walks through the tired throng of horses, making sure. Everyone is there. My head shoots up. My father. Frantically I look around searching for him. Nothing. Before I know what's happening I'm at the clearing, breathing hard and covered in sweat. My father struggles against the ropes that try to hold him. He rears and a rope catches his front legs, he lands and is taken to the ground. Men rush up to him, wrapping ropes around his face, as he thrashes around. I break through the clearing not caring about myself, only the safety of my father. I hear the rope before I see it and dodge to the right. The rope lands limply beside me. Rushing forward I knock a man to the ground, but my foot gets caught in his rope. Soon the rough twine is rubbing my neck and legs and I find myself on the ground. I thrash around wildly, causing the ropes to tighten around my neck. "Let him go!" Someone screams. A human voice, rough and scratchy. Out of the corner of my eye I see four men begin to unravel my father. As the last rope hits the ground he is up and running. All I here before he enters the clearing is "Sy well find you! I promise!" Then he's gone. All that's left is the trembling branches he crashed through moments ago. His words keep echoing through my head until a human voice interrupts. "Take her to the trailer!" A voice calls. They begin to pull on me, but I refuse to stand. Standing means I give in and that will never happen. Ever. They try to pull me up but I push my weight down. A man with black peppered hair walks up with a long stick. The last thing I see before something stings my flesh is him raise his arm above his head. I walk to the creek and sip the cold water, then walk under the oak tree and lie down. My eyes slowly droop until I drift off the sleep. I open my eyes and find four stallions. The oldest looks to be around seven and the youngest probably two. They all look at me like they have never seen a two year old fully before. I just lay there and look at each of them. The oldest is pure black with a blaze that runs in a crooked line down his nose. The two next to him are around the same age, probably four or five years old, and both sorrels. But the last one, he's my age, catches my eye. 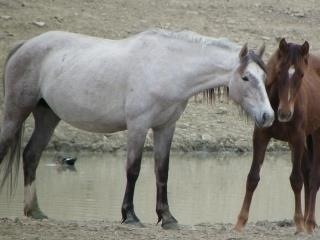 He's a grulla, with dark coloring around one of his eyes and down his face leaving the other side white. I've been looking for to long so I turn my head, but when I look back he's slowly walking forward. My muscles tense, ready for action, but when he gets a few feet in front of me he stops. The others haven't moved, but they watch curiously. Pulling my legs underneath me, I rise to my feet and pin my ears. If he comes any closer I will fight. He takes a step closer and I launch forward. For a mare I'm really stocky, most of my muscle comes from walking up and down the fields which I live, and the treacherous journey it takes to get here. He backs as fast as he can, running into his friends. When he gets to the large pine tree behind him I read. Although I am a few feet away he cowers back, trying to avoid my hooves. As I land I turn on my haunches and gallop back the way I came. Back to my home and he safety of the herd. I don't look behind me until I'm almost to the clearing. Thankfully they did not follow. I slow to a walk and emerge out of the woods. My neck is covered in sweat and its hard to breathe. I see moving streaks barreling toward me, black, grey, sorrel, brown, all running right at me. My instincts tell me to run but I can't will my legs to move. My mother reaches me first, she stops and looks at me "Sy run! Men!" I can't make sense of what's happening. Somehow my legs begin to move. I run next to my herd, but soon I'm passing them, I run past my mother, the dominant mare. I run into the woods, sticks and limbs hit my sides, stinging my skin. I keep going until I find myself on grass, standing under the pine tree, panting. The herd barrels through the woods and comes to a stop beside me. My mother walks through the tired throng of horses, making sure no one is missing. "Cash!" She screams. I shoot up my head. That's my fathers name, if he's not here he's taken. Before I know what's happening I'm at the clearing. I see him struggling against the ropes that try to hold him. He rears and a rope catches his front leg, and as he lands he's taken to the ground. Men rush up to him, wrapping ropes around his face as he thrashes around. I hear the rope before I see it and dodge to the right, the rope falls limply beside me. Rushing forward I knock a man to the ground, but my foot gets caught on his rope. Soon the rough twine is rubbing my neck and legs and I find myself on the ground. I thrash around wildly, but all it does is make the ropes tighter. "Let him go!" Someone screams. It's not a horses voice and they sound odd. Out of the corner of my eye i see four men begin to unravel my father. As the last rope hits the ground he's up and running. All I here before he enters the woods is " we'll find you Sy! Promise!" And then he's gone. All that's left is the trembling branches of the trees he crashed through. They begin to pull me up, but I refuse. I will not stand. Standing and following means I give in, and I won't do that. Ever. They try to pull me up but I push my weight to the ground. A man with peppered hair walks up with a long stick. The last thing I see before something stings my flesh is him raise his arm above his head. The pain brings black spots to my vision and the stings continue again and again. I feel welts begin to rise on my skin, and I stand to make the pain stop. Sorry it's been so long! Been really busy with my horses! Soon I'm being dragged. Literally dragged. My hind feet are dug into the grass, but four large horses continue to pull me forward. This goes on for a mile or two, and then my legs begin to ache. A terrible throbbing ache that burns up and down my body. I can't take it anymore, so I walk. I hang my head low, now wanting to see what they have in store for me. Then it looms in front of me. A large metal box. Inside there's slots, door, dividers, it all become clear. This is the trailer. A burst of energy courses within me. I dig my feet straight into the ground and rear. I ging my body on the front ropes, bringing the four horses down with me. There heads snap back, the ropes twist and break and they run to freedom. Men surround me with ropes. The swishing sound comes again, and my legs are caught. I rear, buck, kick, anything I can do to get away. If I get in this trailer, I will never get home. More men come, bearing ropes ; except for one. I've never seen it before. It's Long with a hole in the front, then there's a click and a boom. Everything goes black. A jolt bounces my body. Throwing me against a wall. Opening my eyes all I see red an grey. I'm in the trailer. My flank is sore from whatever hit me and when I try to lift my head it won't move. I try again, then my neck, legs, tail, nothing. I'm numb almost everywhere. I'm paralyzed. A sudden panic oberwhelms me. 'Why can't I move? What's going to happen to me? How did I get in here?' I like my lips and find that I can open my eyes and mouth, I open and close them constantly. Finally I calm down and look around. I'm In a large area, the floors wood, sides red, with pieces of brown flaking off everywhere. As I lay there I realize I'm exhausted. All day I've ran around and fought for my life, I'm sore everywhere. Might as well fall asleep and rest. I don't know what Tomorow will bring. When I open my eyes I can't see anything, but I know I'm in the trailer because of the constant jolts and bumps that throw me around. My neck moves now, and my legs, but I'm to weak to stand, so I resolve to tucking my legs underneath me and lifting me head. Then the trailer comes to a sudden halt, throwing me forward. My head smashes into the front of the trailer and I black out again. When I wake up I'm not in the trailer, but in a small fence. The fence is tall itself, about 8 ft tall, and there's only enough room for me to walk in a small circle. Horses stand beside me on both sides, there being held in their on small square like mine. As I look side to side I see there different than me. Tall, thin, only solid colors like black, bay, gray, and chestnut. No paints, Appaloosas, or roans. There definitely odd. I look completely different then them. I'm short, stocky, have my scar running from my eye to me back leg, and my colors different a muddle of blue, grey and red roan. I'm definitely different. I decide not to trust them yet. There heads hang low, ribs show, no talking or moving. The only movement I've seen so far is the chestnut next to me lift up his foot or swish his tail to scare off the flies. I want to ask them where I am so bad, but I decide not to when a human walks in. Suddenly all the horses fly to the back of there stalls, cowering as the man passes them. As he approaches me I realize why. He has the stick. I remember that horrible stinging pain that forced me near the trailer. He walks passed the row of horses, and stops in front of me. I haven't moved since I woke up and I don't when he opens my door. He slowly walks in, probably expecting me to jump up and run, but I won't. If I do now I know they'll put me somewhere ill never get out. I have to wait for the right time if I ever plan on returning home. The man holds something else in his hand too. It looks softer then the course rope on my face, and it's shaped like our heads. That's when he rushed forward ad slips the thing on my face. Before I can get up he has the last part under my chin fastened. Now he has complete control over me. I'm standing by the time the harsh twine falls to my feet. Then man begins to pull the rope in his hands, which pulls on my face. I plant my hooves into the ground and don't move. He raises the stick and brings it down on my flank. Black dots dapple my vision and I walk forward. He mutters something under his breathe, but I don't catch it. I'm led away from the pens and into a a large field, but it doesn't have grass. Instead there's loose dirt and a fence surrounding the perimeter. Outside the huge oval is a post which he ties me too, then disappears. I pull back as hard as I can to test it's strength. It doesn't break, and I won't be strong enough to break it. The man returns with a large piece of clothe and something else I've never seen before. Suddenly he throws the clothe on my back and the other object on before I can react. Something pinches my stomach and makes it hard to breathe. I rear trying to slip the objects off my back but they won't budge. Whatever this mans plan is, he's going through with it. He leaves again, and when he's a safe distance away I begin to buck, trying to loosen the grip on my stomach and then i feel it. The wolf is on my back as I run, it's claws digging into my skin, blood dripping down my legs. I fall and roll while my attacker clings on. When the flashback is over the man is back and a piece of metal is in my mouth. Something keeps it secure around my head. It digs into my lips and pinches my tongue. Then I realize what his intentions are, ride me. I've only seen it once before, I was a yearling. Men had come riding horses with ropes in the hands. We only got away because my herd was faster. I'd never realized the point of riding us. Now I do. There trying to break our spirits and use us for things against our will. The metal digs into my mouth as he pulls on the ropes connected to my face, then there's a heavy weight on my left side. His leg is in the foot holder, and soon the weight has left my side and has spread out across my back. My mind imagines the wolf again, and I begin to buck, then run, anything to get him off of me. Anything to make the flashbacks stop. I run him into the fence, he yells something and tugs on my face. Again the metal scrapes the roof of my mouth and pinches my tongue, he closes his legs and there's sharp pains in my sides. He has spikes on his shoes. Before he can do anything again I go straight to the ground and roll. He's stuck underneath me, and screams whenever I stay on my back. Good. I won't let people ride me. Especially him with his spikes and metal things. I've been here a week now. I stay in my pen and never go out unless I'm being ridden. My sides have scabs from the metal spikes (which I learned are called spurs) and my mouth is sore from the bit. All this week I've learned many things like what a bridle, saddle and pad is, but I still have one reoccurring question: what are these horses here for? For the first time since I've been here they let me out into a large field. The grass is lush and green and the sun warms my back. Suddenly I hear the pounding of hooves and when I look up four horses are sprinting down the track. Now I realize why there so narrow with long legs, sleek necks and extremely tall. There race horses. Before my accident my father told me about them. When he was in a bachelor herd the lived close to a race track, and they always watched the horses run. I remember the day my father told me that. He told me the were thoroughbreds, a racing breed. I watch them all practice until the sun is about to set when I realize they never put any horses out with me.